The New York Yankees announced today that right-handed pitcher Michael King and infielder Brandon Wagner were named winners of the 2018 Kevin Lawn Award as the Yankees' minor league "Pitcher of the Year" and "Player of the Year," respectively. The two players received their awards prior to today's Yankees game vs. the Toronto Blue Jays at George M. Steinbrenner Field. King, 23, combined to go 11-5 with two complete games and a 1.79 ERA (161.1IP, 118H, 43R/32ER, 29BB, 152K, 8HR) in 25 games (24 starts) with Single-A Tampa, Double-A Trenton and Triple-A Scranton/Wilkes-Barre. In addition to ranking second among all minor leaguers in ERA (min. 100.0IP), the Florida State League Mid-Season All-Star led Yankees farmhands in strikeouts and ERA and was second in wins. In his first month at the Triple-A level, the Rochester, N.Y., native earned International League August "Pitcher of the Month" honors after going 3-0 with a 1.09 ERA (33.0IP, 4ER) in five starts. Following the season, he was named to Baseball America's Minor League All-Star Second Team and was ranked the No. 5 prospect in the Yankees organization by the same publication. Wagner, 23, hit .267/.380/.461 (116-for-434) with 68R, 21 doubles, 21HR, 67RBI and 70BB in 124 games between Single-A Tampa and Double-A Trenton. 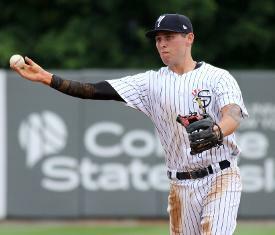 Among Yankees minor leaguers, the left-handed hitter ranked second in home runs and fourth in RBI en route to MiLB.com Organization All-Star accolades. He was named a Florida State League Mid-Season All-Star and finished tied for second in the league with 20HR. The Princeton, N.J., native made multiple starts at first, second and third base.